It is in the altitude of 1800 m of the okutateshina area deepest part, and is known as an inn of the Mt. 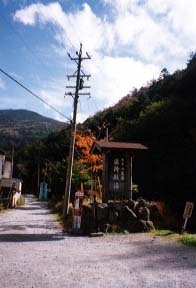 Tengu trailhead.The hot spring which relieves the fatigue of mountain climbing is the historied noted spring that Shingen Takeda cured the invalid.In the hot spring of a smell slightly and the countrified structed-by-Japanese-cypress structure, hydrogen sulfide odor has a bath tab of the fountainhead, and a bath tab of rinsingitselfwith hot water outside the bath, and mind and body can relax the hot spring of the longevity in which the fountainhead carries out a flow out naturally from a bottom especially with a bubble. 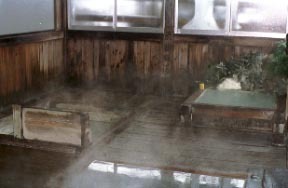 Medical treatment and the Suwa load are love-to-bathing hot spring for loads about an invalid as a spiritual spring of Shingen Takeda treasuring. oh [ one-pot-dishes, red salmon dish-grilled-with-salt, and carp ] -- it is -- or raw horse meat, tempura, etc. According to the season, I am taking out seasonal wild grass, a mushroom, etc. 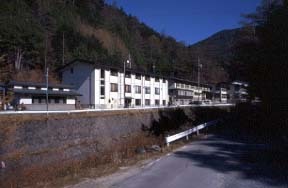 The bathtub of three "east hot springs" and a washing place are nothing. 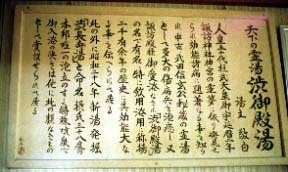 "West hot-spring" bath tabs are the fountainhead 1 and the rinsingthemselveswith hot water outside the bath 1. Room rest of 2000 yen An east and west can be used. It is in front of a Shibugotenyu bus stop (terminal) inn.